Adaptive sports and recreation programs are activities that are modified or designed to allow people with disabilities to participate. Almost any type of recreational activity can be adapted or made accessible for people with physical, visual, cognitive, or emotional disabilities. 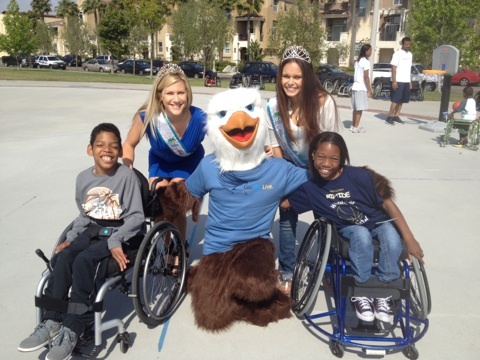 The MMB organization focuses on supporting events that promote sports for people with physical disabilities, such as wheelchair tennis, wheelchair rugby, Jr. wheelchair sports camp, wheelchair basketball, etc. Do I need a sponsor in order to enter the pageant? You are encouraged to obtain your own sponsor for the pageant. However, if you are unable to find a sponsor, the MMB organization will partner you with one of their corporate donors. What is the minimum and maximum age for a contestant to enter the pageant? The minimum age to enter the pageant is 18 years old. There is no maximum contestant age. Do I have to wear a bikini in the pageant? No, you do not have to wear a bikini in the swimwear portion of the pageant. We ask that you wear a swimsuit that you feel comfortable and confident. In addition, we ask that you not wear anything too revealing, such as Brazilian-cut or G-string swimsuits. Is there a talent portion in the pageant? No, we do not have a talent portion in the pageant. Instead we have opted for a panel interview with the judges. Each contestant will privately appear before our panel of judges on the day of the pageant for a 5-minute interview session. Do I have to wear an evening gown in the pageant? No, rather than an evening gown portion, we have a cocktail attire segment. We feel that cocktail attire better suits the “Mission Beach” state of mind. Do I have to be a titleholder in order to volunteer at MMB events? We encourage anyone that is interested in volunteering to contact the MMB Organization for more information on the various opportunities to support adaptive sports and other MMB events. If I become a titleholder for MMB, will I be able to enter other pageants during my reign? Yes, we encourage you to enter other pageants with the MMB Title. As a matter of fact, we will even sponsor the reigning Miss Mission Beach into the Miss Greater San Diego Pageant as long as she meets their requirements. We only ask that you continue to meet your MMB requirements if you should become titleholder in another pageant.